2. Melt chocolate chips in the microwave, careful to not burn them! 3. Add chocolate and peppermint extract to cream cheese mixture and beat until smooth and well combined. 6. How easy was that?! 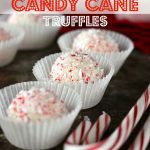 Roll your truffles in crushed candy canes the day you plan to serve them. 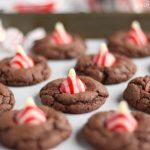 The candy canes slowly absorb the moisture from the chocolate and can become sticky. Wow, these look seriously amazing!! 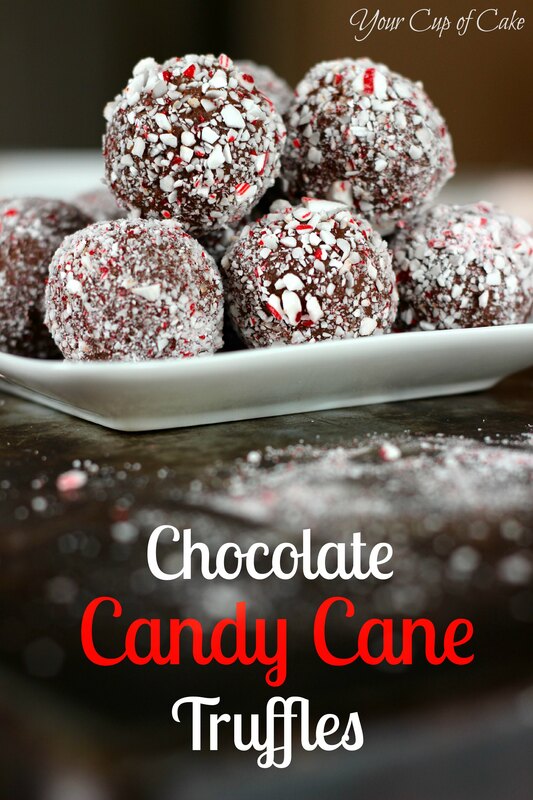 Will totally be making these for my family holiday parties this year, they look awesome!!! 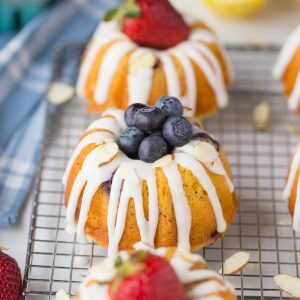 These look delish and super easy! I’m going to try these asap!! Thank you Lizzy! In the first picture, the crushed candy canes look like they’re stuck to regular chocolate (the balls are dark brown). 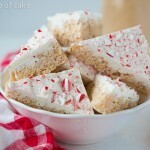 In the other pictures, the crushed candy canes look like they’re stuck to white chocolate (the balls are off-white). Why do they look different in the two photos? It says right about the process photos that those photos are from my White Chocolate Candy Cane Truffles. The process is the same, but the chocolate is different. One question though. 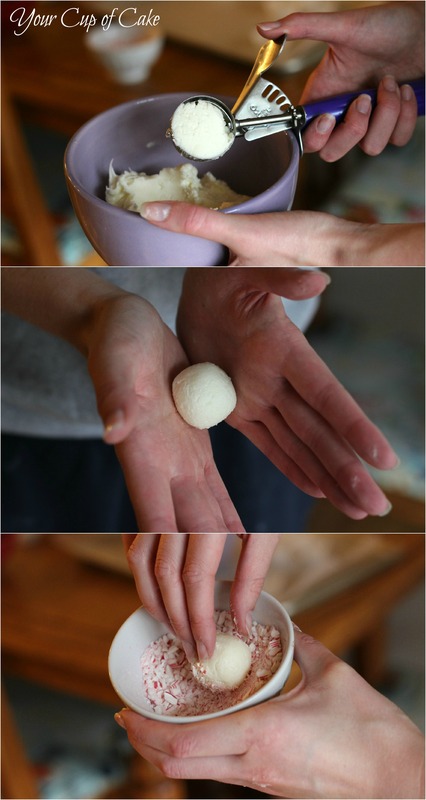 what size is your scoop that you use? I have a 1 tbs. scoop. would that size be ok? Thanks! 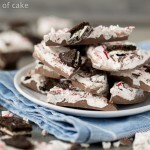 I like the white chocolate ones best because they remind me of peppermint bark! A 1 Tbsp. scoop should be just fine! These are gorgeous!! 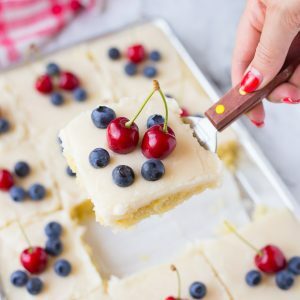 You have great recipes and beautiful photography!! How many truffles to you get from this recipe? These were AMAZING ans SO easy! Thanks so much! I cant wait to try more yummy treats! 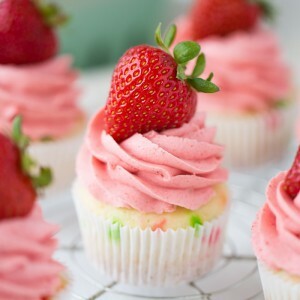 I would love to win the KitchenAid Mixer because thanks to you I have become addicted to making cupcakes. I bring them to work, my daughter’s dorm, dinners……Every week I get your email with a new flavor and I have to make it! 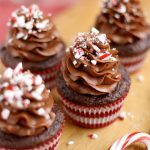 So I think with Christmas in a few weeks the first cupcake I would make in the mixer would be the Peppermint Bark Cupcakes for Christmas Eve! 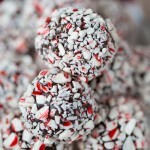 Your note says to roll the truffles in crushed candy canes the day of serving. Does that mean roll them again in the crushed candy canes, or wait to roll them in the first place? Thanks so much – can’t wait to try them! I am also wondering about storing and rolling the truffles. I am making them today (Thursday) but not serving until Saturday. Can I leave the mixture in the fridge until Saturday morning and then make into truffles, or should I roll them into balls today and refrigerate them Saturday? What if I want to give this as a “gift”? What’s the best way to prep, store and give? Thanks. I made these tonight and they’re delicious. Kind of messy, but definitely yummy! These would be just as good with dark chocolate chips, wouldn’t they? I haven’t noticed any different, but if you’re really worried you can crunch them in a plastic bag using a rolling pin! I have done that, but the blender idea sounds so much nicer if it doesn’t wreck the blender! It seems those candy shards pierce the plastic bags so quickly that it makes quite a mess. Your truffles really look delicious! Thanks -I think I may try it! How long do these truffles last for? Can I make them a week before I give them as Crimbo presents? Made these in white and dark chocolate today. Instructions were on point, but the only thing I’d change is adding the peppermint extract while the chocolate is warm so it mixes better. Delicious and SIMPLE!! Even better when your grocery store sells crushed candy canes! Hi Lizzy, these look amazing, can’t wait to try them! 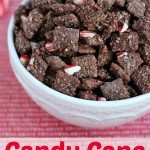 But before I do…wondering if you have ever tried freezing these, either before you roll them in the crushed candy canes (then roll them once they have thawed) or by freezing them completely finished with the crushed candy already on them. It’s always nice to have the “make ahead and freeze” option around holiday time, but of course only if it doesn’t compromise the quality…so just wondered if you or anyone has done this? Thanks in advance what looks to be a wonderful yet simple recipe – always a winning combination in my book! Yes I have popped them in the freezer! It works great! hey! 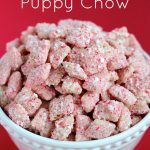 I started to make these and made them to recipe. I came into a little problem. When I took my truffle out of the fridge after 20 mins it wouldn’t roll. Do I just leave it in the fridge longer or did I mess up somewhere ? Mine end up melting all over my hands when I roll them.Somewhat sticky also even with it being in for 30 since 20 was too mushy. It’s distinct characteristic may be the presence of white patches for the body. there a wide range of safe medical and homeopathic remedies to the psoriasis sufferer to choose from. to 97 % of cases treated with Homeopathy show definite improvement without any side-effects. 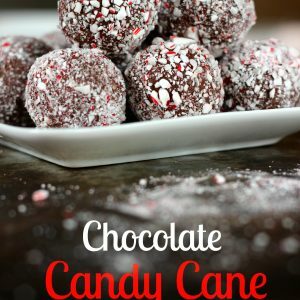 Can you make the truffles the day before & chill them & then when you are ready to serve them, dip them into crushed candy canes?